Do You Trust Too Easily? Are you someone who trusts people from the start until they give you a reason not to? Or are you someone who feels trust should be earned? This is one of those ongoing discussions between my husband and me, and it was brought up again by our date night to see Captain America: The Winter Soldier. It’s a movie almost entirely about trust. 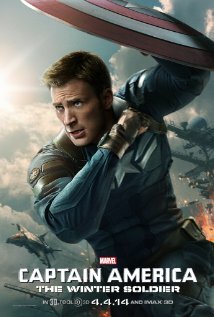 As the movie opens, Captain America is sent on a mission to rescue S.H.I.E.L.D. hostages from a hijacked ship. Nastasha Romanoff (Black Widow) is part of the team that goes with him. But what he doesn’t know is her mission is different from his. She’s been sent to recover the S.H.I.E.L.D. information stored on the ship’s computers, not to save the hostages. Their divided purpose endangers the entire mission and almost gets them killed. Captain America storms into the office of S.H.I.E.L.D.’s director, Nick Fury. He wants to know how he’s supposed to achieve his missions if he can’t trust the people he’s working with. Two very different men with very different views on trust. Captain America sees trust as a necessary ingredient for success because, as a soldier, he had to trust the men he was fighting beside. Fury sees trust as something that can get you killed. The question of who they can trust and who they can’t weaves through the entire story as they discover that S.H.I.E.L.D. has been massively infiltrated by the enemy. People they thought they could trust turn on them and people who they were at first unsure about turn out to be allies. Both men have to give a little in their stance, learning to trust less and trust more. As my husband and I came out of the movie, I realized that there are very few people in my life that I trust 100%. My husband has more people he trusts, but he’s also been burned more often when people betrayed him. Trust is one of those funny things—we always think our way of approaching it is best. I’d love to hear from both sides though. Do you have a lot of people you trust? Are you someone who trusts easily or are you slow to trust? And do you think that’s the best way, or do both sides need to come a little more toward the middle? If you like suspense, I hope you’ll take a look at my ebook Frozen. Twisted sleepwalking. A frozen goldfish in a plastic bag. And a woman afraid she’s losing her grip on reality. Wondering what this blog is all about? On Tuesdays, I cover something science fiction or fantasy related. On Thursdays, I talk writing. The schedule only changes for special events. I’d love to have you sign up to receive my posts by email. All you need to do is enter your email address below and hit the “Follow” botton. I’d like to claim that’s what I’m like, but I’ve been told by too many people close to me that I’m definitely not a trusting person 🙂 One of my best friends likes to tell the story of how long it took me to trust her in the beginning, so I guess I have to believe what they say. I tend to trust until given a reason not to. It’s hard though, especially coming through an abusive marriage. I think it says something about your inner strength that you still give people the benefit of the doubt even after what you’ve been through. It’s not that I don’t trust people but what people think is true isn’t always the case. I might believe you believe what you’re saying, but I’ll probably wait until I see it for myself before acting on it. Boy, talk about tackling the tough topics. I tend to do some of both. It’s not that I trust people right away but I tend to take them on face value, and assume they are what they seem to be. You’d think after a career as a therapist, I’d know better. But it’s a tendency I’m not sure I want to break. I like it that I give people the benefit of the doubt. Similar to what Traci said, I assume they’re okay until they prove otherwise. But when it comes to deeper trust, that has to be earned and I’m slow to let people in on that level. I have several layers of walls around my heart (that I’ve come by honestly). As I get to know someone, I slowly open more and more of the doors in those walls. It sounds like I’m not that much different from what you do in practice. Even though I don’t trust people from the start, I don’t completely shut them out either. I give them enough of a foothold in my life to watch for evidence of their character. I’m coming up blank for a good analogy on this one, but I guess it’s like walking across a wooden bridge in the jungle. A person who immediately trusts walks out and assumes it will hold. A person with complete distrust will never walk on the bridge and will look for a different way around. I tie a rope around my waist and link it to a tree on the solid ground, and then I test each board as I go. Once the bridge has proved itself to be solid, I walk back and forth freely. Excellent related thought. It’s also a very important one with the way our world is structured now. I think real trust can grow whether you’ve met the person in real life or not. I also have made friends with you and with others that I’ve never met in person and yet who I do trust. My husband and I actually originally met online, and we built our friendship through emails and phone calls. I trusted him enough to go alone to pick him up at the airport the first time we were going to meet in person (much to the chagrin of some of my friends). Whether it’s online or face-to-face, when a person shows their character through their actions and the consistency of their actions, I think real trust can grow. That was a very thought provoking post Marcy. And a unique way of tackling the subject.